I felt like making macarons this week, but at $14 a bag, the price of almond flour was holding me back. But then I found a less costly alternative – Trader Joe’s brand almond meal. The trade-off was that it was almond meal rather than blanched almond flour and had little flecks of almond skin. But since my macarons were going to have flecks of vanilla bean in them from vanilla paste, I figured why not have flecks of almond skin too? You don’t need a food processor for this recipe, just a handheld mixer and a good metal bowl for whipping your egg whites. It helps to push the almond flour and confectioners’ sugar through a sieve, so you do need some kind of sieve. The buttercream takes a little more skill, but if you have a stand mixer and already know how to assemble a make-shift double boiler with your stand mixer bowl, it’s simple. Or if you just want to focus on making macaron shells, you can just fill the shells with melted chocolate. The recipe is based on one from Joanne Chang in Fine Cooking. Most macaron recipes call for a combination of confectioners’ sugar and granulated, but this one only uses confectioners’ sugar and the shells are a tad bit cakier and less chewy — in a good way. Also, for best results, use the weights. I don’t think I’ve ever actually made these using volume measurements alone. 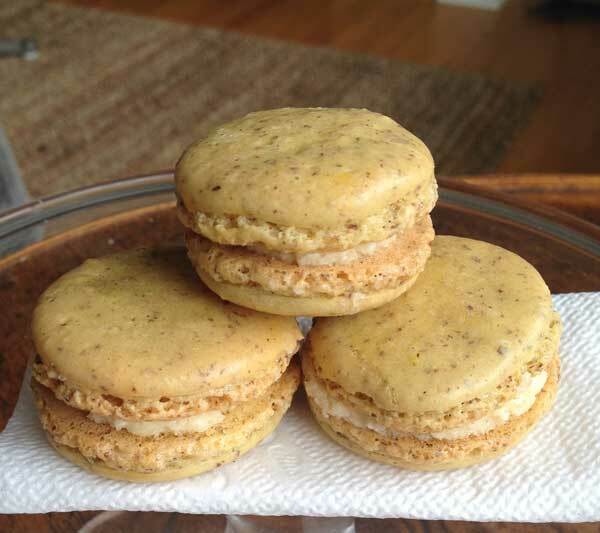 Almond Meal Vanilla Macarons made with Trader Joe's Almond Meal. In a mixing bowl, stir together the confectioners’ sugar and the almond flour. Put the mixture through a sieve to make it finer and remove any large bits. In a metal bowl, using a handheld electric mixer, beat the egg whites on medium speed until foamy. When stiff peaks start to form, beat in the vanilla bean paste and food coloring paste. With a heavy duty scraper, fold the egg white into the almond flour mixture. Spoon the batter into a large (16 inch) pastry bag fitted with a ½ inch round tip and pipe 1 to 2 inch circles out onto the baking sheet. They will flow out a bit as you pipe, but they should not be extremely runny. Let them sit at room temperature for at least 60 minutes (longer is okay, too). 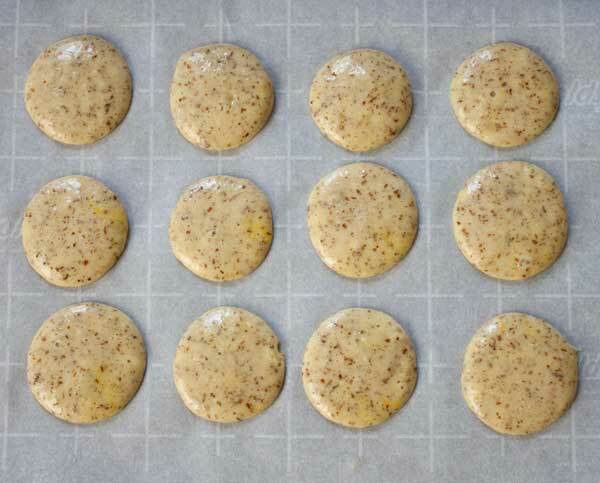 Put the baking sheet of piped rounds in the 400 degree oven and immediately reduce heat to 300 degrees. Bake for 12 to 15 minutes or until the tops appear set and bottom is golden (check one). Let the cookies cool completely on the parchment paper, then carefully peel away from parchment. Buttercream: Find a saucepan that fits under your stand mixer bowl in a way that will let you set the bowl over (but not touching) simmering water. Bring some water to a simmer in the saucepan. Whisk the sugar and egg whites together in the stand mixer bowl and set over the simmering water. Whisk for about 5 minutes or until the mixture is hot to the touch and sugar has melted. If you are not using pasteurized eggs, test to make sure the eggs are at least 140 degrees F.
Move bowl over to the stand mixer fitted with a whisk attachment. Beat mixture on medium-high until billowy and white and cool to the touch (about 6 minutes). Reduce speed to low and with the mixer going, add chunks of butter one at a time. Add vanilla and a pinch of salt. Increase mixer speed to medium and beat for 1 minute or until creamy and smooth. 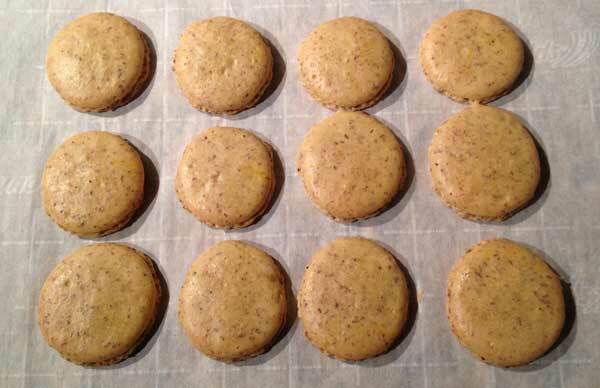 Fill the macarons with the soft buttercream, then chill them just long enough to set. Store the macarons in the freezer in a freezer bag. They look more organic with the flecks. In some ways more inviting than the pristine macaron with the artificial colors. I’m curious how they would look without the food coloring. Not that I’m a purist. I had been wondering how macarons would turn out. Thanks! Katie, I agree. The recipe I learned and which I have been using for years just says to whisk until hot to touch (5 to 7 minutes), while other recipes say to use a candy thermometer and heat until 140 degrees F. It’s always better to be safe than sorry, so I’ll add a note. That’s a Swiss meringue buttercream. I am usually careful to take the temperature of the egg whites before moving them to the stand mixer. Is that not a necessary step here?